Having gone to school in the Philippines on an academic scholarship, the concept of student loans was alien to me. It wasn’t until I got married in the U.S. and had children that I learned having a student loan is no different from having a mortgage to a house. My husband took several years to pay off his loan, but he did. The Filipino American Legal Defense and Education Fund’s (FALDEF) Education Committee, led by lawyer Patricia Astorga, in partnership with the Pilipino American Unity for Progress (UniPro) recently hosted a seminar on the “Ins and Outs of Students Loans and Grants” at the Migrant Center in New York. I was one of the panelists together with Taylor Owen Ramsey, Program Specialist of the U.S. Department of Education; and Stephanie Chrispin of UniPro. Ramsey explained the various loan programs provided by the Department of Education, Chrispin shared her experiences as an undergrad student looking for financial aid assistance; and I provided a parent’s perspective. Being a mother of 4, with two children out of college and another currently enrolled at Columbia University, I was loaded with insights. As a parent, figuring out how to pay for your child’s college is stressful. You want them to go to the college of their choice, but at the same time, what do you do when you don’t have enough finances to pay for their education? You definitely don’t want them to be burdened by loans right after graduation. In the Philippines, our parents made sure they provided us the education we deserve by encouraging is to study at a university of our choice and paying for our matriculation. In return, we as dutiful children are expected to study well and get a good paying job after school. Tuition fees are usually the parents’ responsibility, although there are also some Filipinos who are working their way through college. When my first-born was in middle school and I was researching various colleges, I asked my husband so many questions: How are we going to pay for college? What if she doesn’t get enough scholarship assistance? Do we have to put aside money now so that our daughter can go to the college of her choice? Isn’t it our responsibility to pay for their college education? That was when my husband explained that it would be financially irresponsible for us to pay for our children’s entire college education. That we won’t be teaching our children the value of investing in themselves if we did. How much loan is too much? That was something we discussed as a family. Our decision was made, and our children knew what their responsibility would be, and how much we would be able to contribute towards their college education. After the seminar, a few mothers approached me and thanked me for discussing what was on their minds. Their children were with them at the seminar, and they were relieved to know that there are other parents who don’t believe that the burden of college education lies solely on the parents’ pocketbooks. Scholarships are another way of financing college education. Most private universities offer merit-based scholarships to offset the $40K-$60K a year tuition. Other scholarships are based on need or a student’s financial capability. Your High School’s Guidance office provides the list of local and national scholarships available. Is there a way to pay for graduate studies? Here, Stephanie and Taylor shared their experiences. Student loans for the Master’s Program are harder to get, they said. They advised that a student be employed while taking graduate studies to be able to finance themselves. However, Taylor pointed out that doctoral studies can be paid, or sponsored, through fellowships. Unfortunately, there are few programs for undocumented students. One who went to school in the Philippines would have a better chance of getting a Fulbright scholarship than an American in the U.S.
Taylor pointed out available online resources. The education department’s website, ed.gov, provides plenty of information about student loans, grants and scholarships. 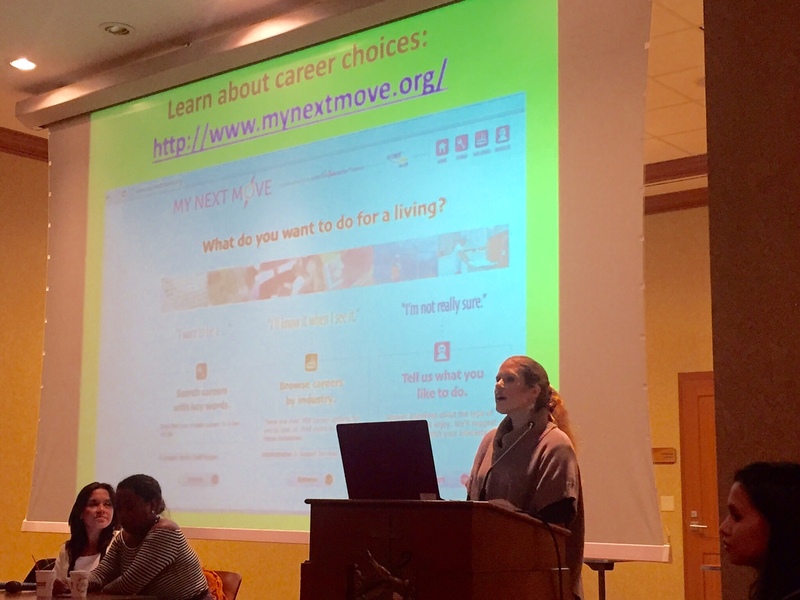 Mynextmove.org is a useful tool to review other options. You can type in a career choice, and the website will list what knowledge, skills, abilities and personality is required for a specific career. It also lists the average salary for specific careers. Studentaid.ed.gov is another website that explains how to prepare for college, types of financial aid, and managing student loans. Both Stephanie and Taylor assured students: Loans are nothing to be afraid of. Having them, especially if they’re working towards a degree in a career that pays well, is important to the economy. Taylor spoke about the Public Service Loan Forgiveness(PSLF) Program. PSLF erases the remaining balance on your Direct Loans after you have made 120 qualifying monthly payments – equivalent to 10 years — under a repayment plan while working full-time for a non-profit organization. • Look at your State Colleges. The tuition is less than out-of-state schools, and student aid may be more accessible. • Consider a two-year program at a Junior College. You will not be burdened with large debt for the first two years of your education. You will graduate with an Associate Degree, and, perhaps a better vision of what career path you want to pursue. During your second year of school, you can apply to a college or university that offers the best course study for your career choice. Scholarships and financial aid are gifts. An American education is widely coveted and worth every penny.